The EFTEM spectrum image (SI) will most likely suffer from x-ray hits and sample drift during the acquisition. The x-ray hits will appear as occasional extreme values in the image planes of the spectrum image. If the sample drifted during the experiment, then the image planes will not line up with each other and spectra drawn from the spectrum image will contain artifacts (e.g., sharp discontinuities). 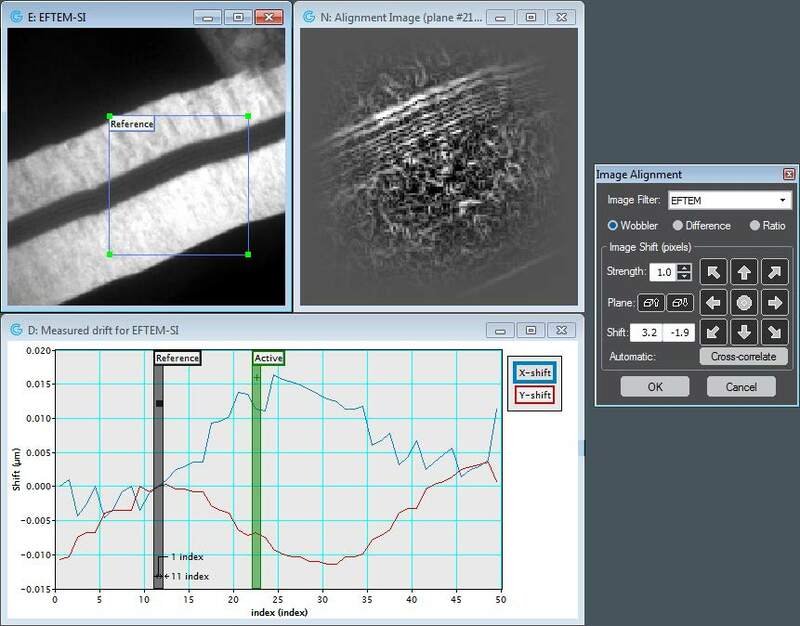 DigitalMicrograph® software can help reduce or eliminate these problems. Since the acquisition of a spectrum image can take a considerable period of time, sample drift can cause the planes of the spectrum image to be offset from one another. The relative amount of sample drift is dependent on a number of factors, including sample/microscope stability, exposure time and also magnification. You should measure and remove spatial drift, by utilizing one of the following options, before performing any subsequent analyses. If any of the automatically determined measurements fails the minimum quality criteria, a dialog will be shown at the end of the measurement, which will offer to continue with manual measurement. You can change the active plane (green) with the two additional Plane buttons on the Image Alignment tool, or via the displayed plane of the EFTEM SI dataset using the slice tool. Note: When you launch the measurement tool while a line plot of measured drift values already exists, these values will be used initially. Press Cancel on the tool to revert to these initial values; while OK replaces them permanently by the adjusted measurements.